Tenting has been a way of life for the Halliwell family, who have not only enjoyed family holidays under canvas, but have also been very involved for many years with the scouting movement. They still enjoy camping, yet the idea of an easier return home from excursions, to "just plug in" without the extensive unpacking and drying often involved with camping, began to have appeal. 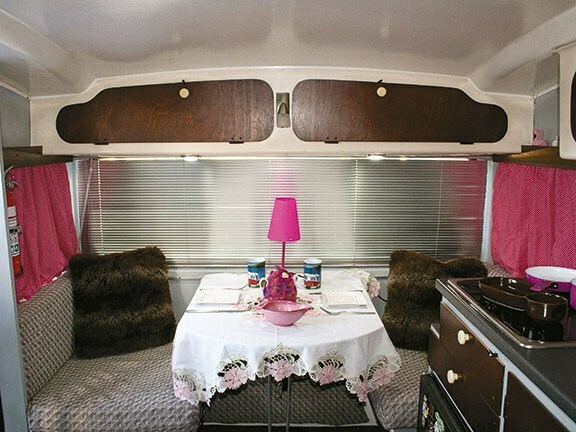 A few years ago they started to toy with the idea of buying a vintage caravan to restore. They looked at a few potential candidates, which were ultimately unsuitable before a friend — who was also looking — came up with a lovely pair of vintage 'vans ripe for restoration. 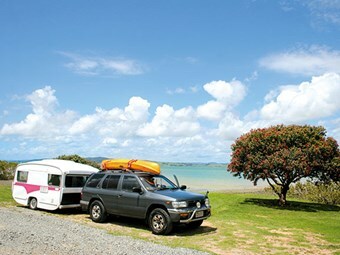 At the time, Peter and Fiona, both employees of Air New Zealand, were camping at Shakespeare Regional Park. 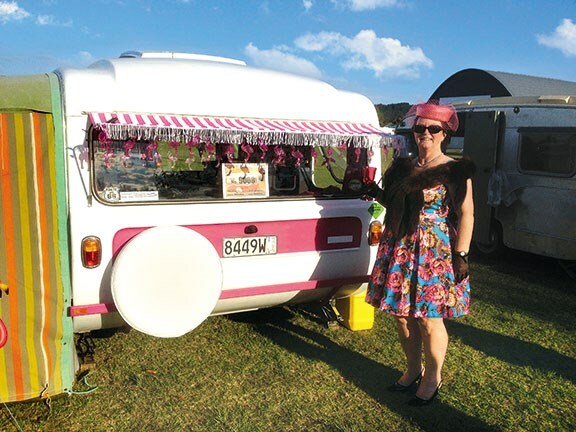 Peter drove to Taranaki and returned to the campground with their new baby in tow. The delighted couple spent a night in their new Lilliput Gazelle and began to plot the restoration project. "When this came up it was just a case of being in the right place at the right time," says Peter. "We decided on the spot this was the project we had been looking for." What made the Lilliput Gazelle particularly appealing was the fact it was essentially roadworthy. The chassis was in overall good condition, with just patches of surface rust, and the vehicle had a new WOF. This meant Peter and Fiona would be able to enjoy using the 'van while it underwent an extensive restoration during the next 18 months. One of the first things the couple did was join the Lilliput Caravan Club of New Zealand. Peter explains, "We wanted to meet like-minded people and hoped to be able to access the vast amount of knowledge club members have accumulated about what would and what would not work, to guide us throughout the restoration." The couple reasoned if they undertook the strip and rebuild of the inside first, they would be able to use their 'van and enjoy reasonable comfort. This turned out to be an excellent strategy. One of their first trips was to the club's AGM in January 2010. They have subsequently attended four AGMs, enjoying the social life, as well as the vast amount of information they have been able to glean from club veterans. "They are such a great bunch of people," he says. With an engineer's eye for detail, Peter was able to accurately assess what needed to be done structurally and also to confidently undertake most of the work himself. Fiona, meanwhile, brought a keen eye to the re-design of the interior and exterior and also took on the arduous tasks of sanding, painting and upholstering. "It was really a team effort," says Peter. Nothing escaped their keen eyes as walls were stripped bare so electrical wiring and gas fittings could be replaced to meet current legal requirements, as well as 20mm-thick polystyrene insulation inserted before the panelling was replaced. A new 'fridge, sink and bench-tops followed. Lighting was replaced and a new king-single bed was built. Outside, the same thoroughness was applied. New wheel bearings were bought and most mechanical bits replaced. New tyres replaced the old. Peter bought a compressor and learnt to spray paint, as layer after layer of marine paint was applied. Each coat was painstakingly sanded by the couple and filled until three coats later the surface gleamed perfectly. The sanding was to prove the biggest challenge. "The restoration of the inside wasn't too bad, but the sanding took ages. We just knew we'd be out there sanding for the whole weekend. That lasted for three months." If there is one thing they would wish for if they had their time over, it would have been to opt for the luxury of a fully-enclosed shed in which to paint and sand, instead of the carport they had at their disposal. But that was minor in the scheme of things because they both really enjoyed the restoration. After the sanding and final painting came the fun of choosing exterior colours. Their initial choice for the Gazelle's distinctive stripe had been teal, however their friends got in first. They wanted a colour which was totally unexpected yet perfectly appropriate. Opting for hot pink, they played up their chosen theme on the inside as well. 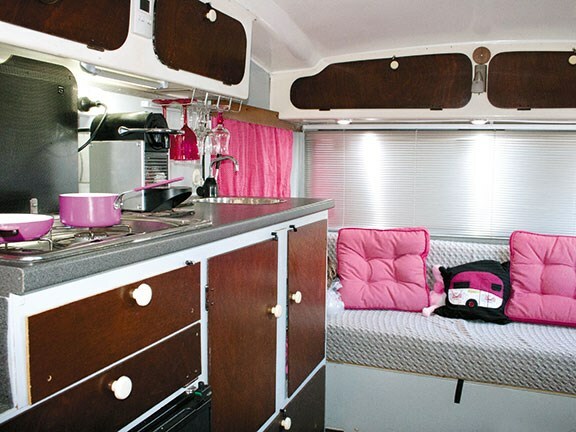 The final touch came with the stunning awning Fiona made from candy-pink striped canvas she sourced from Australia, replete with fringing from Spotlight. Lilly the Pink was dramatically reborn. Fiona and Peter have also bought a three-metre inflatable dinghy which folds up and stows easily in their 4WD. Now the couple enjoys weekends away with the added option of exploring the waterways. They opted for self-containment which Peter says was a relatively simple process. "We had to change the plumbing slightly. We already had a Porta Potti with its own tent and 40 litres of fresh water, although the water tank needed to be resealed, which Peter did using fibreglass. They currently use a standard yellow plastic container for greywater, however they are planning to purchase a suitable enclosed rollaway container with wheels. They have one 120APH deep-cycle battery and also plan to buy a portable solar panel. Peter says, "We really enjoyed the refurbishment process and moving from camping to caravanning suits us at this time of our lives. Perhaps in 15 years' time, we'll look at buying a motorhome. 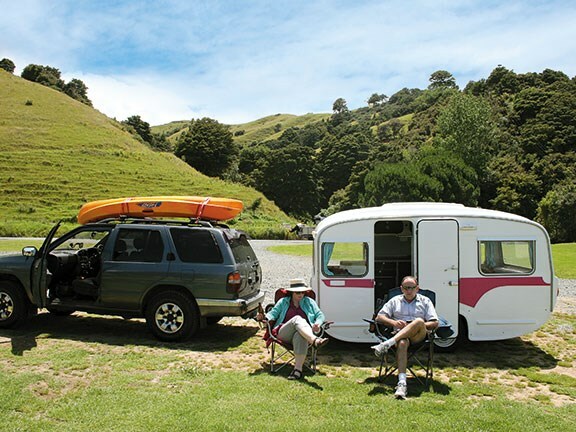 For now, we're loving exploring New Zealand in our Lilliput." Check out a range of vintage 'vans online at MCD. In 1962 Bruce Webster completed the first of his lightweight and compact caravans designed to be towed by the average family car. 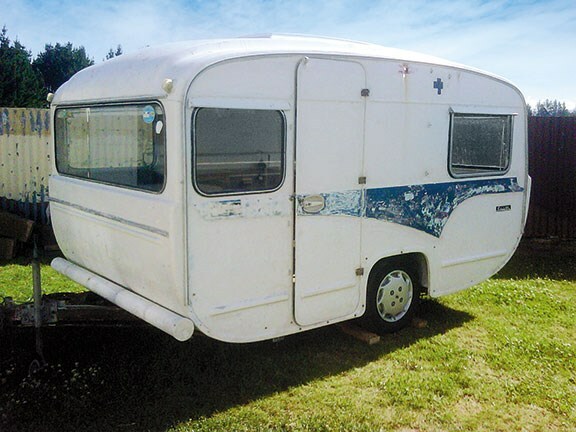 Webster was an expatriate coach builder from the United Kingdom who believed there must be a better alternative to the heavyweight caravans he was constantly repairing for his customers in New Zealand. His design, made from plywood, was three-metres long and just two-metres wide. The family named it Lilliput after the island of the same name in the book Gulliver's Travels, which their son was reading at the time. The caravan found a ready market. It was sold when the family stopped to buy milk from a dairy to a man who had been following them. Webster was buoyed by the sale and made another model which — at 10-feet overall — was not only slightly longer but also lighter, comprising plywood with aluminium framing and a fibreglass roof. Eventually the caravans would all be made from fibreglass. The characteristic low profile of the 'vans came about almost by accident. The height overall was dictated by the height of Webster's workshop: 6'5" overall. This led to the unusual and ultimately successful decision, to attach the floor of the van to the base of the chassis rather than the top, removing the need for an external step and creating a step down and more headroom inside the vehicle. 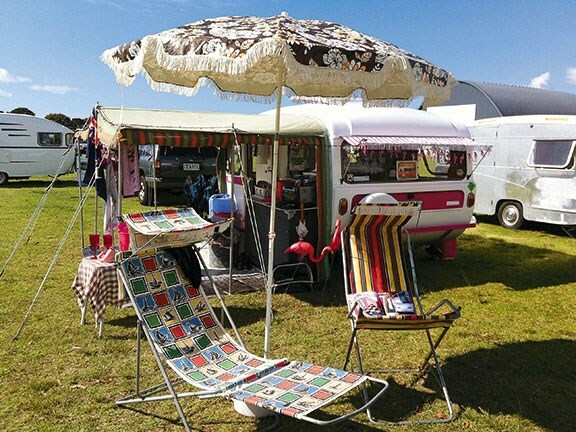 Such genius was eventually rewarded when the Lilliput Caravan Club was formed and its members honoured the humble designer at its inaugural rally in 1988. Bruce Webster died in 1998, but his legacy lives on in the legions of Lilliput lovers. For more information contact lilliput.org.nz/club.